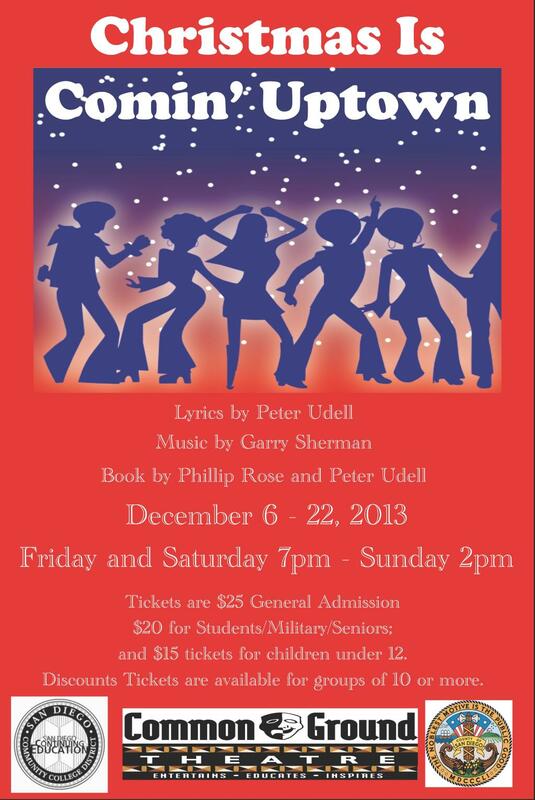 SAN DIEGO – Common Ground Theatre, in collaboration with SDCCD Continuing Education Division, will present its holiday production of “Christmas Is Comin’ Uptown” – December 6-22, 2013, at 7pm. (Friday and Saturday) and 2pm. (Sunday matinees) at the Educational Cultural Complex Theater. The theater is located on the second floor of the Educational Cultural Complex at 4343 Ocean View Boulevard, San Diego, CA 92113. The entire family will enjoy this 1979 Broadway musical, “Christmas Is Comin’ Uptown,” which is loosely based on Charles Dickens’ “A Christmas Carol.” Gregory Hines played Scrooge in the original Broadway cast. The Scrooge in this adaptation is an inner- city slumlord about to foreclose on an apartment house, a recreation center and a church. He gets the usual visits from his late partner Marley; and the ghosts of Christmas Past, Present and Future take him on their rounds. All of those Dickensian characters are dancing, jiving and swinging to a Harlem beat. Celebrate this 50th Anniversary holiday performance with Common Ground Theatre. CGT’s mission is to produce classics and new works by and about people of African descent that entertain, educate, and connect with audiences of all ages, cultures, and backgrounds. Their purpose is to produce high quality theatrical productions that offer a “common ground” where people of all ages, cultures, and backgrounds can interact, connect and share their love of theatre. CGT envisions a culturally diverse, socially relevant, and politically aware theatre organization that nurtures the expertise of amateur and professional artists alike and improves community relations among diverse cultures and underrepresented groups. Proceeds from all productions of will support productions and also provide scholarships for students to attend Common Ground Theatre’s San Diego Theatre Artist Repertory School (STARS) program. The STARS program is a new initiative created by Common Ground Theatre to build community through the arts by providing students of all ages and abilities with professional, affordable instruction in the performing, fine and visual arts. Each performance will be at the Educational Cultural Complex – Thursday, Friday and Saturday at 7pm and Sunday at 2pm. Tickets are $25 General Admission; $20 for Students/Military/Seniors/Groups of 10; and $15.00 for groups of 20 or more. Tickets for children 12 and under are $10.00. For more information and to purchase tickets, please contact the CGT Box Office at 619-272-3209, or go online to commongroundtheatre.org.